Frittata is an amazing food: main course, appetizer, finger food, snack… whatever time of day, it works, it satisfies, and it is easy to make. 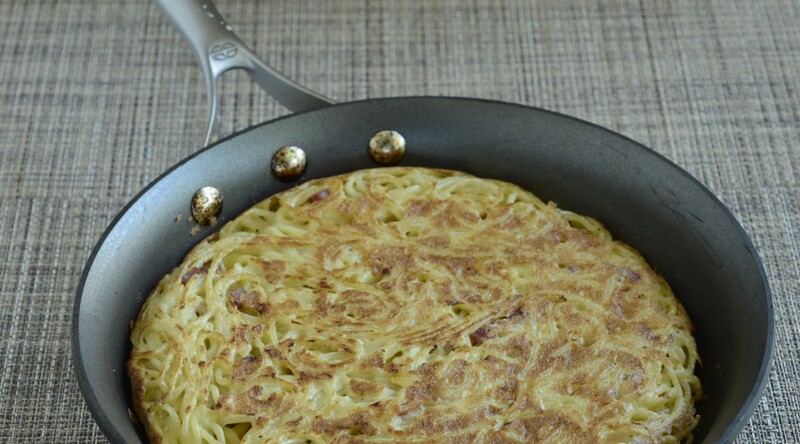 Best of all, frittata is an ideal way to use up leftover ingredients. You can add chopped roasted vegetables, diced Prosciutto, bits of runny or firm cheeses, even boiled pasta. 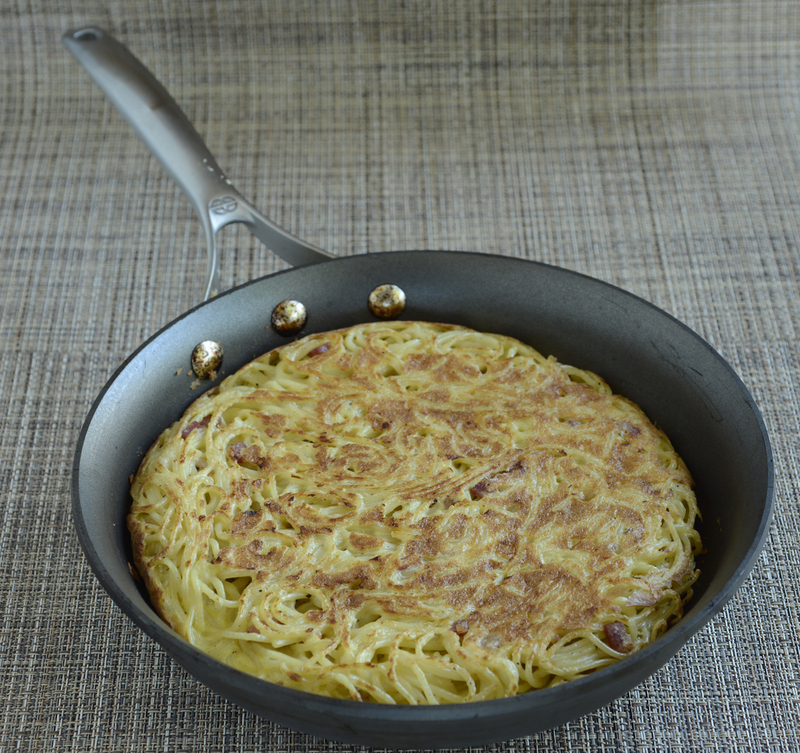 Below is a frittata with the flavors of carbonara sauce, a delicious combination of Pancetta, Parmigiano, and black pepper. I add sauteed onions for a delicately sweet note. For a vegetarian version, omit the Pancetta and add 1/2 pound of diced button mushrooms to the onions. Bring 3 quarts of water to a boil. Add 1 tablespoon of the salt and the spaghetti. Cook, stirring often, until al dente. Drain and place in a bowl. Meanwhile, in a large bowl, beat the eggs vigorously for 2 minutes with the remaining 1/2 teaspoon of the salt and the pepper; the longer you beat the eggs, the fluffier and lighter your frittata will be. Add the boiled spaghetti before it cools off and starts to stick together, and stir quickly to prevent the eggs from scrambling, as the spaghetti is hot. In a 12-inch nonstick skillet over medium heat, place 1 teaspoon of the olive oil, the onion, and the Pancetta. Set over medium heat and cook, stirring once in a while, until soft and golden, about 10 minutes, adding a bit of water if needed to prevent scorching. Add to the eggs and spaghetti in the bowl, stirring quickly to prevent the eggs from scrambling, as the Pancetta and onion are hot. Stir in the Parmigiano. At this point, I usually taste for seasoning and adjust as needed; if you are concerned about eating raw egg, you can certainly cook a small portion of frittata first before tasting. Place the same skillet on a medium flame and brush with 1 teaspoon the olive oil. When the skillet is hot, after about 1 minute, pour in the frittata mixture. Cover with a lid and cook for 5 minutes, or until the bottom is golden and the top is set. Using the lid for easy flipping, invert the frittata onto the lid. Place the empty skillet back on the heat and brush with the remaining teaspoon of olive oil. Slice the frittata back into the skillet, uncooked side down. Cook, uncovered, for 5 more minutes, or until golden and set on the bottom as well.